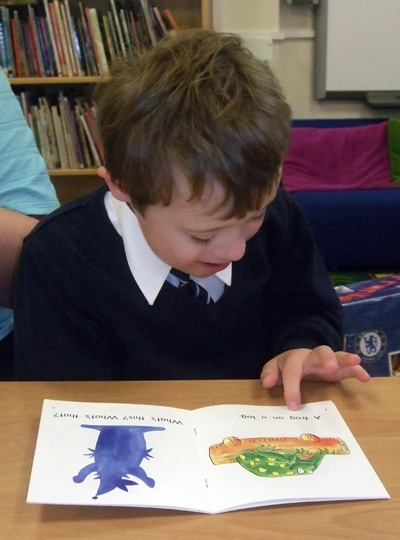 Educational research has found that reading can be a relative strength for children with Down syndrome. Reading opens up new opportunities for learning and language development. 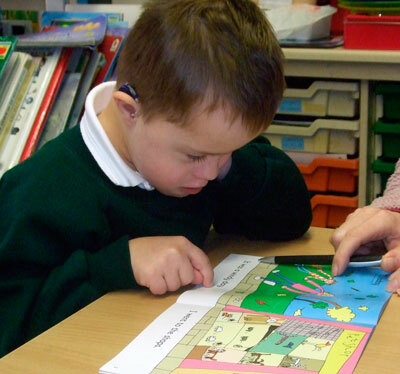 Today, thanks to education research, we now know that reading can be a strength and that children with Down syndrome often read better than would be expected for their language and mental age levels. Many children with Down syndrome can begin to learn to read in their preschool years. As they progress, the children tend to have an uneven reading profile with reading comprehension and the ability to use phonics lagging behind reading accuracy. In addition to exploring how reading develops, researchers have also explored the effects of reading on aspects of language and shown that reading comprehension can be stronger than listening comprehension and that printed words can help children with Down syndrome learn spoken words. The early reading studies began to change educators' beliefs about what children with Down syndrome might achieve, and now many children are taught to read. Independent reading ability is not the only beneficial outcome. Most educators now recognize the value of recording learning in the classroom in books with pictures and print as this can aid recall of the content when read to the child who is not able to read independently. Many educators and speech and language therapists use the written word to help children with Down syndrome to learn new words and sentences and to support their spoken language development.